BEIJING - China has taken significant steps to fight HIV and AIDS, but still must reach out to more patients in the vast country and overcome a lack of cooperation from some government officials, a UN AIDS official said Tuesday. There are an estimated 650,000 people living with HIV in China, according to the most recent government statistics from 2005. HIV gained a foothold in the country largely due to unsanitary blood plasma-buying schemes and tainted blood transfusions. 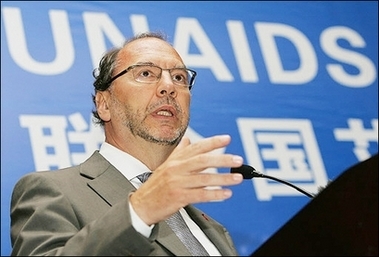 "I believe that over the last few years there have been serious progress and good results in the fight against AIDS in China and now the challenge is to sustain these efforts," said Peter Piot, executive director of UNAIDS. He said successes in China include top-level government commitment and transparency, as well as proper funding, availability of antiretroviral drugs and outreach programs. "I've been coming to China for 14, 15 years and I can say in the first five or six years there was basically no receptivity in terms of the issue," Piot said. "And now today a lot is going on. You look at budgets, systems are being put in place, I think it's really very different." Piot recently returned from Shangcai county in Henan province, where blood-buying businesses passed HIV to thousands of people in the 1990s. He toured a clinic and AIDS orphanage. The number of AIDS deaths declined by 50 percent in Henan province between 2002 and last year, said Wang Longde, China's vice minister of health, who also spoke at the UN news conference. Cases of transfusions using infected blood have dropped since the 1990s. The government has banned blood buying, and forbids blood donations by prostitutes and intravenous drug users.